Ytterbium was discovered in 1878 by J.C.G. de Marignac in Geneva, Switzerland. 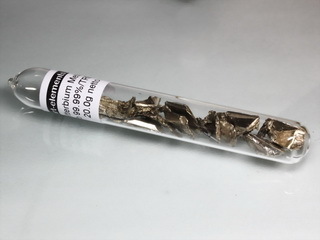 Ytterbium is a soft, silvery-white metal of the lanthanide group. It has an abundance of 3.3 ppm in the earth's crust and is always found in combination with other lanthanides. The metal is soft and malleable, oxidises slowly in air and reacts with water. Applications of the metal are limited, research being the principal area of its use. sealed in ampoule under Argon - For laboratory use and your elements collection.